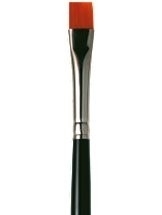 Contains synthetic, firm bristles narrowing to a thin, flat line to ensure the most exact placement of colour. Laura created the technique of lining the eyes by dotting eye colour across the lash line with this synthetic brush. Brush upward to soften the line.